There will be no lavish party. No extravagant celebration. This is because we have decided to save all the money we would have spent on a lavish party and donate it for a good cause – The Rainbow Trust Children’s Charity. 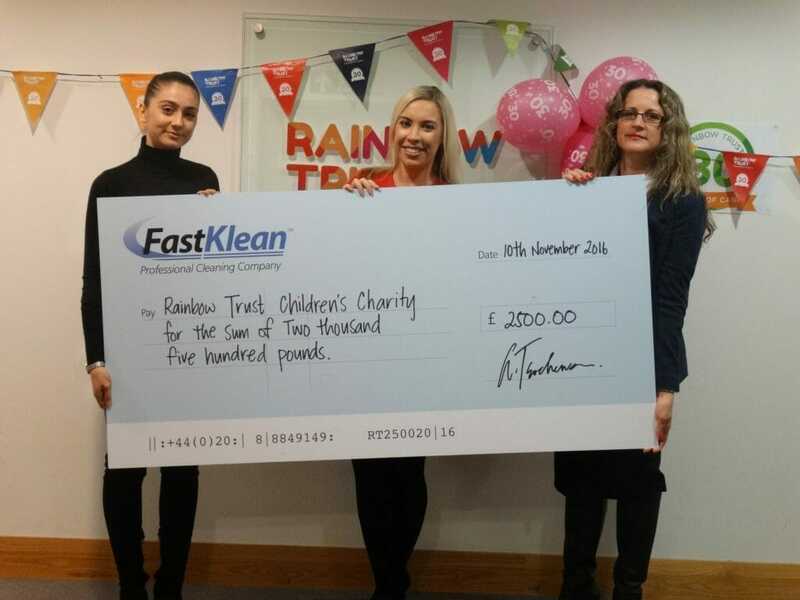 FastKlean will continue to support the charity throughout the coming year with various fundraising activities. Needless to say, our most reliable and loyal clients will be presented with personally addressed hampers for our 15th Birthday. The last 15 years have been a journey of continuous growth, improvement and perseverance to stay at the helm in our segment. As we all know – a smooth sea never made a skillful sailor. We have run our course of learning curves and challenges yet we are still learning. Having started from scratch with domestic cleaning as our prime service, additional services have branched off over time to form whole new segments such as carpet cleaning, upholstery cleaning, car valeting, window cleaning, professional gardening, removal services, property maintenance, swimming pool cleaning, commercial & office cleaning, etc. This in itself has called for a larger capacity and need to implement new cleaning methods & techniques as well as new machinery in order to satisfy the growing demand. As a result, our portfolio of clients comprises an extensive number of market-leading companies, from estate agents and banks to construction companies and student campuses – they all have awarded us their vote of confidence based on our competence and the results & customer care we provide. To mention a few – NHS, Virgin Money, Jaguar, Harvey Nichols, Pall Mall, Wates, KFH, The Unite Group PLC, Regus Management UK Ltd, etc. A major achievement of ours is that FastKlean have grown enough to qualify and participate in public tenders where we rub shoulders and compete with all other major companies and trendsetters in our sector. However, none of the above would have been possible without our people. A selection of 250 operatives with an average length of service of 9 years, having staff who have been with us since day one. We are proud of this fact as we know that this would have been impossible if it weren’t for the integrity, transparency, solid work ethic and loyalty being the pillars of our business philosophy. This is what has helped us establish a strong team of people who are just as committed as we are. Among all achievements, however, there is one which appears to be the most meaningful and transformative, namely – the way FastKlean has evolved from a simple, profit-making mechanism into much more than a business with core values, long-term vision and asset-building mindset. FastKlean has now become a sustainable, contributing, self-standing cause devoted to making a difference. We have taken part in numerous charity events by providing voluntary services or financial and moral support to people and organisations in need such as Noah’s Children Hospice, BBC Children in Need, Channel 4 Stand Up to Cancer Support, Breast Cancer Awareness. We have also taken part in many festivals and communal activities of no less importance. We are also a regular participant in various networking events, the most recent being the Summer BBQ and Networking Event organised by London Landlord Accreditation Scheme(LLAS) and UK Landlord Accreditation Partnership(UKLAP). As a main sponsor of the event, we have had the opportunity to introduce ourselves to those who didn’t yet know us thus further exposing our brand to the vast UK property market in search of new business opportunities. Another similar event was the National Spring Cleaning Week 2016 where FastKlean was the official partner of the event and was live on 7 Radio programmes. As a way of thriving in the right direction, we have had a mobile application as well as a software system developed especially for us to ensure seamless operation. Both have proven quite a viable investment which has further raised the standard of our customer service and has significantly improved our overall efficiency. In addition, we have recently had our head office comprehensively refurbished making it brighter and more energy-efficient. This has brought the so much vital change of scenery to the working environment for our 16 associates devoting their time and effort to deliver the best services in our sector. That’s not all – we have recently opened the doors of our second office. This is to further expand our potential and productivity. Over the last 15 years, FastKlean has proven to be one of the most trusted and accredited companies in the sector. We have been decorated by many professional industry associations and governing bodies for our quality of services and sustainability. They all conduct annual inspections and regulate our standards to ensure best practices and methods are maintained and built upon at all times. Accreditations are much more than ‘badges of honour’, they are a responsibility which we have always proudly held and have always tried to add more and more accreditations to reflect our professionalism and commitment. Thank You All for your vote of confidence and long-standing loyalty. FastKlean will continue to prosper with no less enthusiasm, unrelenting drive for excellence and ever-improving services.